A few weeks ago, some friends visited us for the weekend in Tahoe, and we got to talking about healthy snacks. It turns out one of their favorite healthy snacks is sauerkraut. “Seriously?” I asked, my eyes bulging a bit at the thought. I’d been thinking more along the lines of reduced sugar cookies made with coconut oil for a healthy snack. But anyone who knows me knows I’m usually game to try something new. And I had never made my own sauerkraut. 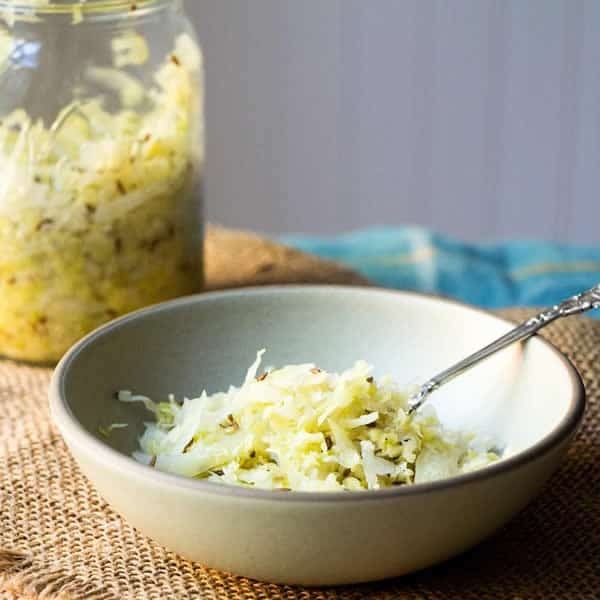 I grew up with sauerkraut – it showed up regularly at our house alongside pork chops on top of platters of mashed potatoes. But it was only recently that I became aware of its health properties. It’s all about fermentation. Ferments with live lactic-acid producing bacteria, lactobacilli, intact are particularly beneficial to digestive health, immune function, and general well-being. Too much science? Bear with me for a moment. Lactobacilli are ubiquitous, found on the surface of all living things, but particularly plentiful on the leaves and roots of plants growing in or close to the ground. Through the fermenting process, the starches and sugars in fruits and vegetables are converted into lactic acid. As the lactobacilli multiply, they enhance the digestibility and nutrition of the food being fermented, and promote the growth of healthy flora in the intestine. 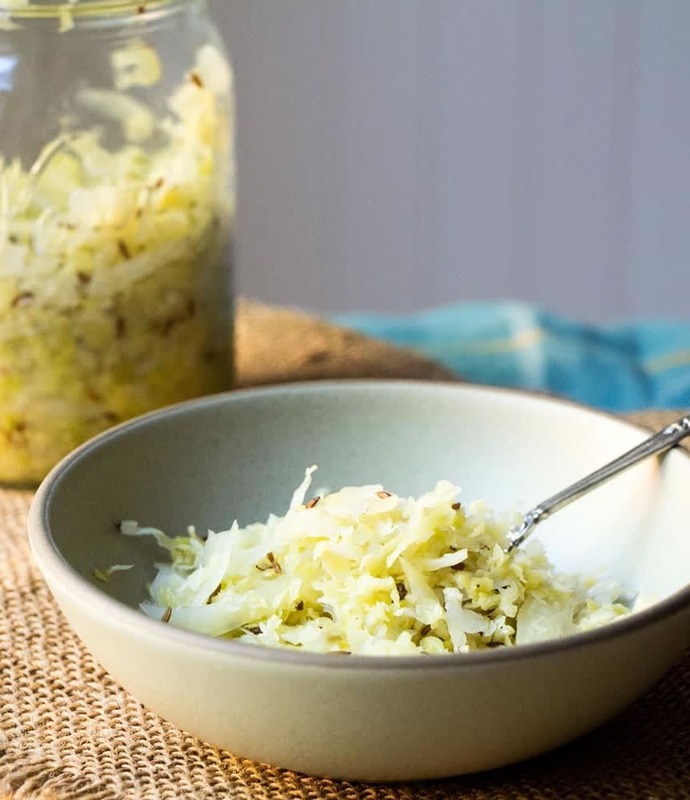 In a nutshell, fermented foods tend to be very good for the gut. It’s written that Tiberius, of Roman fame, always carried a barrel of sauerkraut with him on long voyages to protect himself from intestinal infections, so the Romans figured this out long ago. If you’re interested in delving into the science and nature of fermented foods, The Art of Fermentation by Sandor Katz, a true expert on fermenting, is a must read. Another great resource, a little less technical, is Nourishing Traditions by Sally Fallon. At it’s most basic, fermenting just requires salt to be added to fruits or vegetables to 1) draw out their juices and 2) to inhibit the growth of bad bacteria. Once the fermentation process begins, lactobacilli multiply like crazy, and the need for the salt is eliminated. But if you’ve just made some cheese and happen to have some fresh whey on hand, it can be used in place of some or all of the salt. Whey is super rich in lactic acid and lactic-acid-producing bacteria. But don’t use dried whey for this. Keep the food being fermented completely submerged in its juices during fermentation to eliminate any oxygen contact with the food. If you don’t have enough juices, add a little water. I insert a smaller jar into the jar containing the food and tape it down to keep the food submerged. If you can’t keep the food completely submerged, then close the food up tightly in a jar for a few days, and leave it on the counter. Be sure to leave one-inch head room to allow the vegetable to expand a bit during fermentation. In winter, it may take longer to ferment. Conversely, at summer’s peak, the heat will facilitate a faster ferment. It can take anywhere from 4 – 7 days to achieve the level of fermentation you want. Start tasting it after the third day. Small bubbles are normal after one day – it’s a sign of fermentation. If you see scum or mold forming, don’t worry. That’s normal too. Just remove it with a spoon and let the process continue. Place the shredded cabbage in a large, wide bowl and sprinkle the salt over it. Toss to coat. Using a jar filled with something dense, like jam, pound the cabbage until the juices are released, about 10 minutes. Anything heavy and solid will work for this pounding. 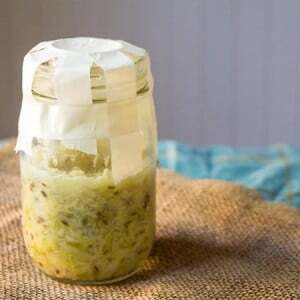 Toss with caraway seeds and place in a quart-sized mason jar, pressing firmly down to tightly pack the cabbage. I recommend a small jar that fits into the mouth of the mason jar for this. 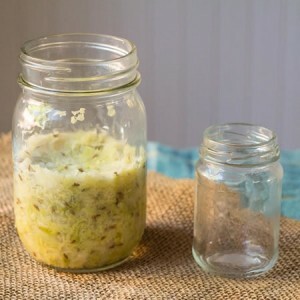 When all the cabbage is packed into the mason jar, press the smaller jar down to submerge the cabbage in its juices, and tape it into place. Cover with some cheesecloth and store on the counter for three days. Test the sauerkraut after 3 days. If you prefer a stronger flavor, continue fermenting. I stopped at around 6 days. Place a lid on the jar and store in the refrigerator for up to several months. Snack on it regularly. Your gut will thank you. Susan Pridmore lives with her husband just outside San Francisco and writes The Wimpy Vegetarian blog. Shortly after cooking her way through culinary school she moved her diet to mostly vegetarian, to the horror of her husband, Carnivorous Maximus. For the past three years, Susan has been creating vegetarian recipes on The Wimpy Vegetarian blog with “Wimpy Tips” for those wanting to add a little meat or fish. Susan‘s recipes have won contests run by Food52, Whole Foods, and Davidson’s Eggs, and her work has been published on the Weiser Kitchen blog and Ask Miss A. Follow her on Facebook and Pinterest. Are the caraway seeds absolutely necessary to the fermentation process? Or are they simply for taste? I absolutely can’t eat them. Great question! The caraway seeds are strictly for taste. They have absolutely nothing to do with the fermentation. Feel free to eliminate. Wow, having grown up in Pennsylvania Dutch country, I love sauerkraut – but it never entered my mind to make my own. This looks so easy that I have just added cabbage and caraway seeds to this morning’s grocery list. I love it too, Liz. It never occurred to me to make my own either until our friends suggested it. They made it sound so easy I started it right away. It’s wild too – I had a little intestinal disturbance a few nights ago and decided to have a little. It was amazing – my little intestinal thing cleared right up. Magic stuff. Any tips to identify if something unhealthy is growing in the sauerkraut? I’ve been making my own goat cheese and have been curious about the same question there? So far I’ve been very successful, but it makes me a bit nervous. I’m retry good with keeping things sterile, but on the chance that something undesirable is growing, I’d like to know what to watch out for. Thanks for sharing your recipe and participating in October Unprocessed! Great question, Shana. I make my own cheese too, so I totally understand. For sauerkraut at least, your best indicator will be smell. The sauerkraut will unmistakably smell like it’s going bad. There won’t be any question in your mind. You shouldn’t have any trouble as long as the cabbage stays completely submerged in the liquid or is in an airtight container. Problems arise when oxygen is introduced. Just hit the farmers’ market to buy cabbage and 10 quarts of sauerkraut now working. I added juniper berries to the caraway seed to give it Alsacienne flavoring. Yummy ahead.